After the suggestion of last year's trip to the National Railway Museum, York, which was organised by Bob Davidson, the club committee asked Bob if he would organise this year's club outing. Bob said yes and at the AGM asked the club members where they would like to go. The popular choice of the members was Barrow Hill Round House. Some members had been before but only when it was a British Railways working depot and others had not been at all. 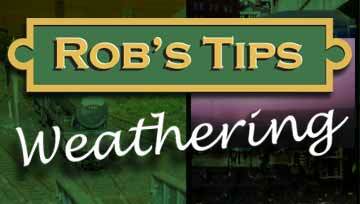 Bob rang around the coach companies and decided on a 37 seater midi coach booked with Silverline Land Flights. While organising the coach Jim Holloway suggested a trip to Peak Rail as it was becoming apparent that we going need something else to do, as Barrow Hill was not going to take all day to look around and as there was no charge to get in, money would be left over in the trip pot and Peak Rail would break the trip up and be something different to Barrow Hill. Bob phoned Barrow Hill to advise them of the visit and confirm they were open that Sunday, while Jim phoned and made a group booking with Peak Rail. On Sunday 6th September 2009 at 08:30am our Silverline coach left Hobs Moat with 34 passengers (members, member's' relatives and member's' friends) aboard. We headed along the A45 Coventry Road and on the M42 and on to the M1 towards Chesterfield. Within Chesterfield we turn off on to the road which leads to an old industrial estate, but soon got stuck because of a low bridge. After some smart reversing and going the long away around we arrived at Barrow Hill Round House. On arrival most of the members went for a quick look in the shop so I took the opportunity to get some photos in the round house while it was empty of people. 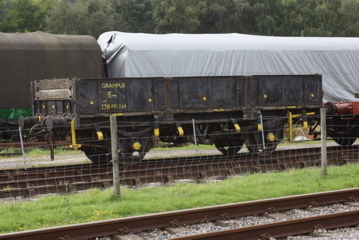 There was a small shunter (No.12589) on the turntable being started up to shunt a class 20 outside. The diesel fumes lingered and helped make a wonderfully atmospheric photo of the black 5 No. 45110 and LMS Jinty 3F No. 41708. 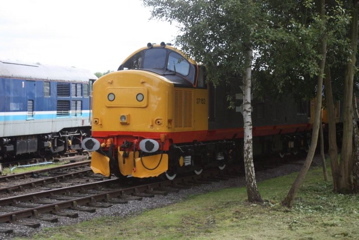 After photographing all that I could in the roundhouse I went outside to start photographing the array of diesels, starting with Peaks. The view I found for photography of the yard was from the embankment which was more than likely the old coal stage from when the depot played home to steam engines. 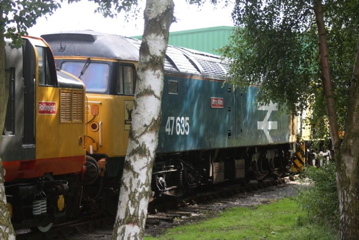 Other classes within included a Deltic, Class 73, Network Rail's class 97's, Class 20, Class 37, Class 56, Class 47 and Class 03 shunter all packed in by the signal box. Some of the members had started talking to two of the volunteers who agreed to give us a tour of the loco’s outside the workshop, the side the public don’t normally see. The loco’s these side of the depot were in different states from a recently outshopped class 37 to a Class 08 with a lot of bits missing. Other locos in the line up included a Class 26, several Class 37's, several Class 47's, a few Class 20's, a Class 31 and a Class 57. The one volunteer also showed us the electrics parked down the side of the Round House: Class 82, Class 84 and prototype Class 89. After thanking the two volunteers we headed for the Café for a cup of tea and spot of lunch. After lunch there was time for a few last photos and back on the coach to the second location, Peak Rail. We arrived at Peak Rail Rowsley South and were met by the station master. 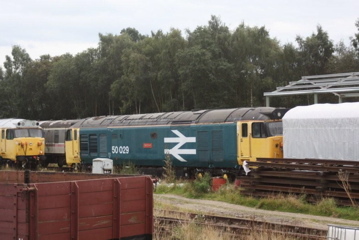 He gave us a quick tour of the station and while most the members went and got a cup of tea, I headed down the Car Park to see what photo’s I could get of 50029 and 50030. After photographing the class 50's I headed back to the station and on to the narrow gauge railway that runs down the side of the loco shed and where there were some more diesels parked. It was £1 for the ride, but worth it as I got good photo’s of Class 31 No. 31270 in Regional Railways Livery, Class 44 peak D8, Class 47 No. 47635 and in Railfreight red stripe, Class 37 No. 37152. Back at the station I had time for a quick cup of tea before our train was due. A WD saddle tank No. 150 named ‘Royal Pioneer’ hauling 6 coaches (5x Mk1 including miniature buffet and 1 Mk 2) all in BR Maroon livery made a quick turn around as we boarded our reserved carriage. We set off for Matlock riverside with a short stop at Darley Dale. On return to Rowsley South we boarded our road coach and headed for home. Peak Class 44 No. 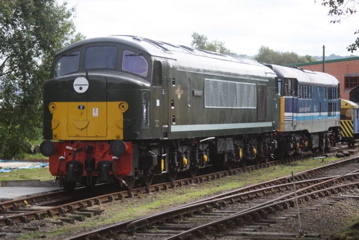 D8 and Class 31 No. 31270 in Regional Railways Livery. Railfreight red stripe livery No. 37152. Class 50 No. 50029 'Renown'.